It seems the world for 80s kids and before is divided into 2 camps- the Play-Doh eaters and the not-Play-Doh eaters (I fall into the latter- it always stunk to me). You may have had your own stack of dough pots at home, made little peas out of it and flung them at friends in school, made spaghetti with the Fun Factory in daycare or gotten one of those teeny tiny pots for Hallowe’en. Let’s have a look at where Play-Doh made its humble beginnings. Originally formulated as a wallpaper cleaning product at the request of Koger’s Grocery in Cincinnati, OH, the pliable dough originally came in a paper can with a metal bottom and in one colour- white. When creator Noah McVicker took his little dough to a convention for educational supplies in the 1956, he soon learned from teachers that the non-toxic ‘dough’ was just the right pliability for little hands (if you’ve every tried to give a brick of Sculpey to a 3 year old you can appreciate why this was such a big deal!!) It seemed the true purpose of Play-Doh had been discovered. The request of Kroger’s at the time of development was for a product that could clean coal residue off of wallpaper as this was the main way of heating homes. The post-WWII advent of vinyl wallpaper which could be wiped down with soap and water and alternate fuels becoming available to the average joe pushed the cleaning dough from manufacturer Kutol Chemicals to its very own production company, Rainbow Crafts Company, started by McVicker and his cousin Joseph. It was sold in the department store Woodward & Lothrop at the time. By 1957 improvements to the composition were being made (top secret recipe!! ), new colours yellow, blue and red were added and paper bottoms were added to the original can design to prevent rusting. Soon Play-Doh took to the airwaves with television adverts featuring the likes of Captain Kangaroo and Romper Room and a patent was granted to the McVickers in 1960. 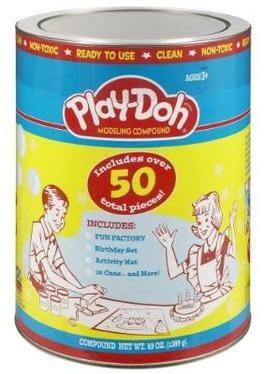 1960 was a busy year for Play-Doh- mascot Play-Doh Pete came into the picture and mini-cans of PlayDoh debut in stores. In 1964 the little tubs of dough went international, selling to Europe and by 1971 Rainbow Crafts merged with Kenner Toys (a name every proper 80s kid should remember). During the 80s more improvements were made to the containers and new colours were added again, being made available with the original 4 as an 8-pack for sale. All plastic containers replaced the longstanding cardboard cans. The 90s ushered in more change for Play-Doh but certainly no slowdown; Play-Doh joins Hasbro as part of its Playskool line of products after Hasbro acquires Kenner, Tonka and Parker Brothers. Celebrating it’s 40th birthday in 1996, Play-Doh comes out with new colours gold and silver. The first decade of the 2000s saw lots of toys being introduced and re-introduced in which to mould Play-Doh into all sorts of fun shapes. 2006, which marked the 50th anniversary of the compound saw the awesome 50 colour pack and the Pick Up Stick- a simple device to pull Play-Doh up off of surfaces. Those who have spent hours pulling blue out from under their fingernails everywhere rejoice. The original Play-Doh recipe included ingredients flour, water, salt, boric acid and mineral oil. Today’s recipe is mainly made from water, salt and flour but the 2004 U.S. patent lists other ingredients such as a retrogradation inhibitor, salt, lubricant, surfactant, preservative, hardener, humectant, fragrance, and color. There’s actually a cologne spray from the Demeter fragrance library to commemorate the 50th birthday of Play-Doh and it smells like- you guessed it. Personally I would never buy this….